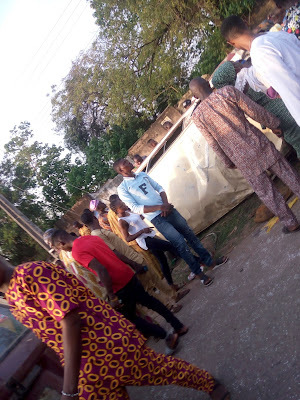 There was an accident that happened in the city of Ibadan yesterday at Poly ibadan area. A bus shuttle conveying people was said to have lost it breaks. The driver who couldn't explain what really happened said he lost control of the bus when he noticed the break wasn't functioning. The driver was said to have been on top speed when he noticed this and then diverted to the other lane, but somersaulted on hitting the road divider. InoutNaija was at the scene of the accident and as at the time of writing this report, no live was lost. Although, many were rushed to a near by clinic for proper treatment as they sustained deep injuries.